No doubt your family has cherished holiday traditions, and we hope you have a safe and happy holiday season filled with on-time connections and free of travel delays. As much as you enjoy your traditions, we thought we’d share some of our Christmas favorites from around the world. Every year, the city of San Fernando plays host to the Giant Lantern Festival. From humble beginnings, the festival has expanded to the point where San Fernando is recognized as the “Christmas Capital of the Philippines” and the party lasts the second half of December. The lanterns have gotten bigger too, now 15 feet in diameter. Lantern makers wrap 5,000 light bulbs around steel frames. The frames are placed on barrels that serve as rotors to turn the lanterns in a shimmering display of light. Thirteen boisterous brothers known as the Yule Lads come down from the mountain cave 13 days before Christmas to delight and frighten children. With names such as Sausage-Swiper and Candle-Stealer, they play pranks and pave the way for the arrival of their peg-legged brother Stekkjastaur, the Icelandic equivalent of Santa Claus. They also take on the role of answering children’s letters to Santa. Another Icelandic tradition is the Jolabokaflod, “Christmas book flood,” when people give books to each other as gifts, prompting a wave of new releases in the months before Christmas. The Cavalcade of Lights actually takes place in November, heralding the beginning of the holiday season. The event features musical and circus performers, ice skating and a fireworks display. It also includes the lighting of the city’s 60-foot-high Christmas tree. The tree is adorned with more than 525,000 lights and 500 ornaments. To be environmentally conscious, the lights are energy-efficient LED bulbs. Thousands pack Nathan Phillips Square to take in the show. Christmas falls at the beginning of summer Down Under, so after the traditional caroling (with some of the particularly wintry lyrics changed) and family time, Aussies head to beach on for barbecues. Some people do family time on Christmas Eve and hit the beach with friends on Christmas Day, while others wait until Boxing Day hit the surf. Sometimes Father Christmas makes an appearance at the beach in swim trunks. While you may have been lucky enough to snag one of those fire logs that smells like KFC, that’s nothing compared to the Christmas Day tradition in Japan. Some people treat Christmas as a romantic occasion and go to dinner in nice restaurants, but most families head to KFC for some chicken. 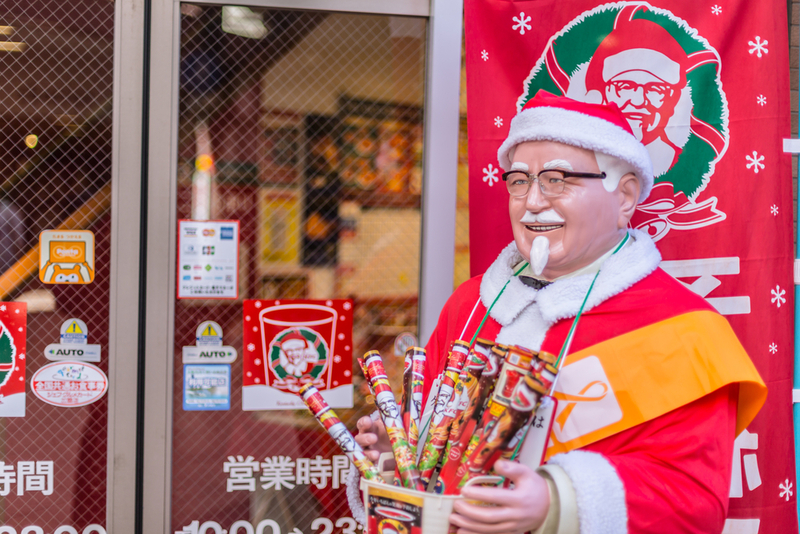 After overhearing some expats discussing how they missed having a turkey dinner on Christmas, Takeshi Okawara -- manager of the first KFC in the country -- came up with Kurisumasu ni wa Kentakii (“Kentucky for Christmas”) as a promotion in the 1970s. It took off, and now Christmas KFC dinners have to be ordered weeks in advance.